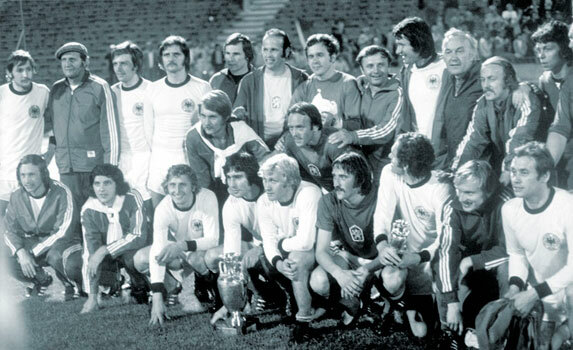 The 1976 tournament was the most exciting of the first generation of the competition, with four outstanding teams: Czechoslovakia, Holland, West Germany and Yugoslavia. In the group stage, Czechoslovakia lost 3-0 to England at Wembley but won a fog-delayed return in Bratislava 2-1 to finish a point ahead. Yugoslavia, Spain, USSR, Belgium and West Germany also progressed to the quarter-final stage, while Wales were the surprise winners of their group, finishing ahead of Hungary and Austria. The only other upset in the qualifiers was in Group 5, where Holland squeezed through on goal difference ahead of Italy and Poland. In the two-leg quarter-finals, Czechoslovakia defeated the fancied USSR, while Holland, inspired by Johan Cruyff and Johan Neeskens, saw off neighbours Belgium. West Germany got the better of Spain, while Yugoslavia won a bad-tempered tie with Wales to claim a semi-final place – and also earn the hosting rights. Czechoslovakia set the tone for the finals with a thrilling 3-1 win over Holland in extra time, with English referee Clive Thomas sending off Neeskens and Wim Van Hanegem. In the other semi, West Germany needed extra time to beat Yugoslavia as they recovered from 2-0 down to win 4-3, with new German hero Dieter Muller scoring a hat-trick. In the Final, the Czechs led 2-1 with one minute remaining when Bernd Holzenbein equalised to send the match into extra time. With the scores still level after 120 minutes, penalties followed and Antonin Panenka scored the winner with an outrageous spot-kick. After their loss to England early in the qualifying campaign, this was the new European champions’ 21st game without defeat. 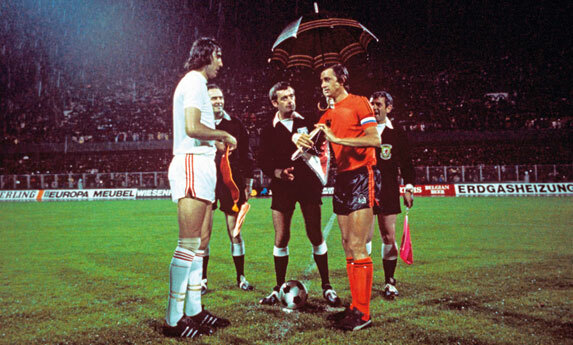 Referee Clive Thomas holds an umbrella over Johan Cruyff before the Holland-Czechslovakia semi-final. West Germany midfielder Rainer Bonhof is the only player with three European championship medals, and the only player to have won the trophy twice. But although he was part of the squad that triumphed in 1972 and 1980, his only Final appearance was when his side lost in 1976. Antonin Panenka became famous for his cheeky, chipped spot kick over the diving goalkeeper that won the 1976 tournament, but at the time the Czechoslovakia midfielder and his team-mates were unaware that penalties had to be taken. At the end of 120 minutes they headed back to the dressing room in the belief that a replay would be necessary. Uli Hoeness missed the decisive penalty for West Germany in the Final. It was to be his last-ever international.